An extensive range of food packaging solutions for you. Our Food Packaging maintains the highest level of quality, cost effectiveness and sanitary solutions helping your product to retain freshness, withstand its structure and stand out from a crowded shelf. Extend your products shelf-life and increase your productivity with our extensive range of food packaging equipment. From Table Top Sealers, Gas Flush, Skin Pack, Dip Tanks & Production Line Equipment we can provide a solution for your business needs. Specialising in customised, flexible packaging films. Our exceptional range of packaging films have been carefully optimised over time. Our Film Rolls can be tailored to suit your individual needs. We also Film Roll Recovery services. Fully Compostable, Bio-Degradable and Fully Recyclable food packaging now available. Our range of environmentally friendly food packaging products are strong, sturdy, durable and they look great. From Forks to Sandwich Platters we have a product for you. Our Thermoform machine provides medical packaging to the healthcare, dental, and pharmaceutical industries. The thermoform packaging machine heats a sheet of plastic until it is pliable, forms it over equipment, and cools it to form a sterile package. We specialise in Custom Ready Meal and Catering Packaging. Our Gastro Trays come in 5 different sizes. Our Dual Ovenable CPET trays offer value and convenience to your customers. Our Trays are available in different colours and styles so choose the combination that suits your product. Versatile Packaging was formed in July 1998. The name Versatile originated from the original vision for this packaging company: “to maintain versatility and innovation to ensure that our packaging solutions continue to evolve and surpass the rapid ever-changing needs of our customers.” Both directors have an extensive food production background, which enables Versatile Packaging to give a 'hands-on' solution to customers. We offer FREE delivery on orders over €100. Our delivery service is fast, professional & reliable. Alternatively, goods can be collected from our main warehouse in Co. Monaghan. Pop into our kitchen for a quick cup while our expert warehouse team load your order. Versatile Packaging offer custom Film Slitting and Damaged Roll Recovery services. Our Film Production Team have over 20 years of experience handling Film Rolls. Help your brand stand out from an ever crowded shelf with our Graphic Design Partner. Together we can create a memorable brand of the highest quality. 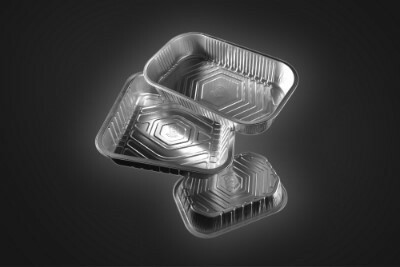 Versatile Packaging are exclusively offering ‘ground breaking’ foil trays. NIR detectable and Fully Recyclable Packaging now available! !